Everyone was very polite and easy to work with, no complaints! The deck has a great view of the ocean. The house is beautiful and comfortable. Great location and so close to everything. Location was amazing, house was very clean and well stocked. They added bucket with dog blankets, toys, leash was amazing - so thoughtful and really appreciated by all!! Great house - will stay again. Thank you! I requested 2 high chairs shortly after making my reservation and was told you only had one because one had broken, and I was told to call again before check in to make sure we could have two, but was told you still only had one! That was the only downside to this rental property. It was the perfect house for an extended family. The grandparents got the lovely master suite and the rest had the basement. Furnishings were nice but kid friendly and the kitchen was well equipped. They seem very friendly and accommodating. Our trip was very special. The house met our needs in every way. We love coming here. All members helpful and quick to response to questions. Very pleasant. Excellent property. A lot of space for everyone to move around house. Especially one person who was using a walker. Lovely and cozy home. 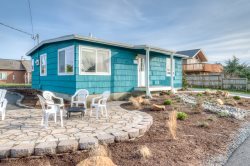 Coastal View in Manzanita is our favorite vacation property on the Oregon coast. We've stayed in Cannon Beach, Arch Cape, Rockaway Beach, Pacific City, Bandon, and Gold Beach and this house in Manzanita is our favorite. It is well priced too. We're already planning another week at this house for next summer. Janet was fabulous in assisting us. I would offer a strong suggestion to work on the glass railing system on the north and west sides. I feel that they need immediate attention and I was concerned that someone could lean against them and fall off the deck. Everybody we worked with was professional and friendly. We enjoyed our stay so much. The house was well-equipped and very clean. It was wonderful. Really nice house and close to the beach! This was a wonderful home! My mother, who has mobility challenges and is reliant upon a wheelchair, was able to enjoy this home as there are no steps between the upper entrance and any of the living spaces/2 of the bedrooms. The management company had sufficient communication and the house was perfectly maintained and had a better appointed kitchen than expected. Great space for a family with kids and dogs. Entry and 2 of the 4 bedrooms are on same level. Nice view from open kitchen, good for entertaining. Because of the limited number of days our guests were visiting, I appreciated being able to check in on Christmas day. Had a great time, the house, the beach, having our family together was awesome! It is so comfortable, the view is great, and the place is great. Thank you all!